REPUBLIKA.CO.ID, MOSCOW - Russia condemned the new wave of Israeli attacks on the Gaza Strip. Permanent members of the UN Security Council's judgment, the aggression of the Zionist regime against the Palestinian people is totally unacceptable. "Disproportionate attack on Gaza is not acceptable at all. Moreover, many civilian victims," a spokesman for the Russian Foreign Ministry, Alexander Lukashevich as reported by PressTV, Friday (16/11). He added that President Vladimir Putin continues to monitor developments in Gaza. Putin, he added, was very concerned and demanded the violence in the region immediately terminated. "Moscow is deeply concerned with what is happening in Gaza and called for attacks cease immediately. Further escalation of violence will not go unpunished," he added. 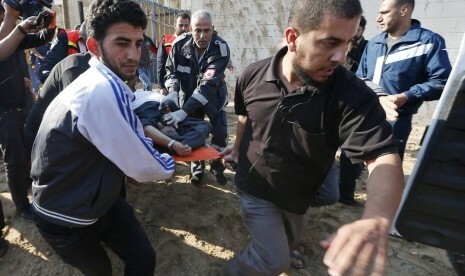 The new wave of Israeli attacks on Gaza have killed at least 17 ​​people since Wednesday. A leader of Hamas' military wing, Ahmed Al Ja'abari participate killed in series of attacks.